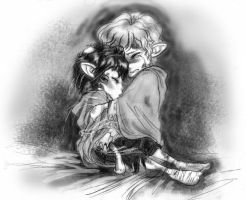 Don't know if I commented on this one yet, but this is one of the most stirring pieces LotR fanart I've ever seen. I love this! Sam is my favorite character. Very touching piece! I think in the movies this aspect of Sam is expressed not quite in the right way. I like, that hobbits look like in book! amaizing emotions! Well, in the movies you may be missing one thing... ^_^ Sorry if I caught you off guard. Did you? I still don't see what you mean. You see, I didn't take the picture from the movie. In the book Frodo wasn't wrapped up like a mummy, just bound up to the shoulders with cords that Sam cut immediately. His eyes were closed, btw, as Sam had seen in the mirror of Galadriel. I'm just trying to understand what you mean. Would you please explain it to a poor ninnyhammer like me? So, as I recall in The Return of the King when Frodo gets encased in webbing, he was completely wrapped from head to toe. But in the second novel, Shelob only bounds him. I read the books seven times and should know, all I did was kind of mistake them both. There. Ok. Perhaps now I understand. Perhaps. Don't overestimate my intelligence, though. At the moment I feel quite dumb. One of the best works of these two I have ever seen. Well done. ''Messer Semwise e le sue decisioni'' ottimo disegno! wait...you mean sam was supposed to have black hair and frodo was supposed to have brown hair? how did jackson get that wrong? Yes, Frodo is described 'fair-haired' while all of Sam's features, from skin tone to eyes and hair, are described tan/brown. I don't know how he did that. This is really well done. The colors are absolutely wonderful, I love the contrasts. The mood is so real. Great job! That is amazing. It makes my heart break.